Color sensor can be used with the instrument of automatic control system to detect the color, color patches and lines, and objects existence, can realize automatic positioning, color identification, correction, register, counting and other functions, with high sensitivity, fast response, strong anti-background light interference, compact structure, easy to use and low price. 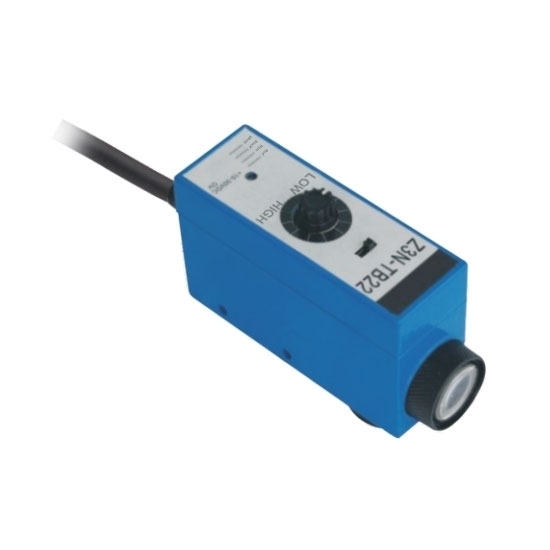 Color mark sensor is used to detect various labels. It can detect the difference in background color with rapid processing speed, even slight difference. Color detection sensor can adapt the wave length automatically, which can detect the slight difference in gray value, regardless of the mixing color of label and background. Applications: Color sensor can be used in the detection of printing and packaging equipment, such as bag making machines, slitting machines, film cutting machines, packaging machines, etc. Tips: How to select light source of color sensor? White light: a hybrid light source consisting of a variety of wave length (color). Monochromatic light: refers to the sensor light source can only emit light of one color (red/green/blue). Two-colors light: refers to the sensor light source can emit light of two colors (for example: red+green), but only one color can be selected during work. Three-colors light of red, green and blue (RGB): it refers to the ability of a sensor light source to emit red, green and blue colors, but only one color can be used at work. If simply focus on the cost and budget, using white light is a good way to save money, but detection performance will reduce. Using a monochromatic light source can effectively improve the color detection performance, but cannot detect multiple colors and the combination of background patterns. The two-color light source needs to switch the light source switch manually and the operation is not flexible enough. For RGB three light source color sensor, actually it uses monochromatic light during working, but light source color is automatically set up according to the detected colors of background and color mark by color sensor, so the price is relatively expensive. In this short video, ATO will show you how to wire a color sensor, and how to use a color sensor for color detection.